For the record: I'm not a card carrying Breslover chassid by any stretch of the imagination. I guess I can be considered "friends of Breslov;' I have great respect for the derech, Tzaddikim and Chassidim, but I consider myself a Chabad chossid. And being that Uman, the week before Rosh Hashana, has so many activities to take part in, and so many conditions that one can be staying under, it is impossible to experience it all (even if you wanted to). Furthermore, everyone has their own varying personal sentiments, attitudes and expectations, therefore my experience is obviously extremely limited by my own particular situation and cannot be considered anything other than that. It wasn't my first trip – it was my 6th actually (5th Rosh Hashana) – but it was the first time in about 8 years, and my, how things have changed! Truth be told, it's only a change in degree, not in metzius, but I wonder if Mardi Gras can hold a candle to the scene that I walked into in Uman; you can find any and everything there: People from literally all walks of life – 22 odd thousand of them – showed up in this Ukrainian city for Rosh Hashana at the gravesite of R' Nachman of Breslov. Amid blaring music of all kinds, and people dressed in every way – from the most conservative to the most wild – we trudged up the hill in the late afternoon, the Wednesday before Rosh Hashana. Shlepping our bags and our bodies, we made our way past R' Nachman's kever, through the crowd, past the soldiers, police officers and local gangsters; we passed the bizarre bazaar of booths where people were hawking books, Cds, food, jewelry and more, to the building just off the corner of Pushkina and Belinsky streets. Once our room was arranged we started settling in, but exhausted from the trip – a trip that included ticket problems, a two hour delay sitting in the plane waiting to leave JFK, and a 10 hour plane plain ride full of Chassidim who thought they were in beis medrash, as well as Ukrainian stewards who were not amused or in good humor – I basically ate, davened and hit the sack. Thursday: Woke up and headed down to the tzion (R' Nachman's kever) for Shacharis. The crowd was enormous everywhere, but I found a minyan just inside the gated area around the tzion next to the many shelves of burning candles. The davening was led by a modern looking sefardic fellow, probably in his low 30's – and being that I am unaccustomed to the sefardi davening, this itself was a new experience and I found it really quite beautiful. It seems to me that half, maybe more, of the guests in Uman were sefardic – but that's just an impression that I had; I have no idea what the actual percentages were. As the day progressed we walked around the area, we bought hot dogs from a wild looking Chossid, and Ukranian Pepsi from a grocery stand; we browsed the tables, I said Tikkun Haklali at the tzion with my children, my kids bought various souvenirs up the hill in the "shuk" on Pushkina street (they bought a full communist soviet officers uniform for $7 (must be checked for shatnez), piles of soviet coins, hand made wooden articles like wind chimes ($4), a cane ($2), jewelry boxes($4), digital wrist watches ($1) , and some other stuff) where the locals have a long line of booths set up for them to sell various items to the "tourists." We napped, we davened mincha, learned a bit, davened maariv, ate, and went to sleep – erev Rosh Hashana selichos (referred to simply as 'Zchor Bris') would be the following morning at 3:30 (if I remember correctly). Friday: Selichos. I let my younger children sleep. I, with my oldest son and some of the others (we had a total of 7 men & 3 children in the apartment), went and found our seats in the Kloiz – the main Ashkenazi Breslover shul (although it seats only a few thousand people) – our seats were a couple rows from back of the room. The Kloiz is quite a different scene than the one that exists on the street; here the mood is serious – there is a sense of awe, Rosh Hashana was in the air. Selichos takes quite a while; afterwards we do hataras nedarim & daven. The day is mostly spent resting and getting ready for Rosh Hashana. I say Tikun Haklali with my children at the Tzion. The crowd is so large that it's impossible to find a place inside, so I find myself a place out of the gated area. Later in the day we went to R' Elazar Kenig to give him a pidyon nefesh – there was a line of people there that moved fairly quickly, most people took only a minute. R' Kenig was shining in a somewhat superhuman way – his face glows and his smile radiates calm and serenity. He knows me and my oldest son; he asked my younger two their names. He gives us a brocha and we head back to arrange things for shul. The kloiz filled up rather quickly. Before I knew it, Rosh Hashana was here – it seemed to happen so fast. The davening was quite special, and I remembered the mood from the Rosh Hashanos I had already experienced in Uman years ago. Shacharis runs basically from 6:30AM - 3:30 PM with a break for selling aliyos, and a break for Kiddush after Krias HaTorah. During the breaks I put my head down and immediately fell asleep. Really, for me, the davening is the attraction – the nusach is especially beautiful, even though it's hard to hear from my seat. Occasionally the noise from outside windows behind the building gets to be a problem, but they clear the people away from there if it lasts too long. R' Efraim Kenig's mussaf (the first day) is always the high point for me, and R' Moshe Binenstock's mussaf (second day) was great as well. Davening with thousands of people together, uniting many different types of individuals, has a great impact on me every time. To me, leaving home and traveling 6 time zones does something significant to Rosh Hashana (aside from the exhaustion): I left my home, my security, my comfort, my familiarity, my routine – I left it all behind. By doing so it can't be just another day; Rosh Hashana has taken over my existence. I don't hear of work, politics, sports, or my neighbors – all that is thousands of miles and many hours away. Even my wife, my security blanket who I missed dearly, isn't there – I'm less of person, I'm one of thousands, I'm virtually insignificant. I can't imagine that there is anywhere that the feeling of subjugation to the King at His coronation is more palpable than under these conditions. When the shliach tzibbur utters the word "Hamelech" (from 'Hamelech Yoshev") there is a thundering applause (in Breslov, the Chassidim clap when Hashem's malchus is mentioned in the davening as a hamtakas hadinim – sweetening of judgments). The first time I heard this, many years ago, I was taken aback, but every time since then I get goose bumps. I feel that the King has accepted the crown. The meals are rough. We had tickets to eat in the cheder ochel (meal tent), but the scene there was a little hard to handle. The crowd, the noise, the lack of comfortable space made it a challenge. I sat next to a baal habatishe Flatbush litvishe type of fellow who – shockingly – lives on my block and has no connection to Breslov (he comes simply because he likes the davening). I am floored to find out that I just happened to be issued a seat next to a neighbor that I barely know (although my wife knows his wife, who she met afterwards and they had a good laugh). But overall, the meals were somewhat of an ordeal, and they burned me out (policing my kids – which taught me that putting children too close will spontaneously combust into flying food violent pushing – didn't help matters). The second night, we took some food and returned to our rooms to eat it in peace and quiet, and the second day meal we were guests at a friend's apartment – one that they own, and redesigned with all the modern conveniences - that seuda gave me a boost of strength and energy. On Shabbos afternoon there were various shiurim given in the kloiz. I went to hear Rav Kenig's shiur in Likkutei Moharan, (on the passuk "Ashrei Ha'am Yodei Teruah") about "tikkun hamoichin" (purification of the intellect). In another corner another large shiur began. For whatever reason, they began with a responsive chant at the top of their lungs – it was so loud, that it was impossible for anyone else giving a shiur in the shul to be heard. After this went on for a while, some people attempted to shush them – instantly R' Kenig jumped, almost in shock and pain, his eyes got big and he waived them to stop shushing the other group. I have always been awed by R' Kenig's demeanor and sensitivity; his impeccable midos never cease to impress me. I remember Tashlich in Uman in years past to be a highlight of Rosh Hashana. In years bygone, the entire lake was surrounded by Chassidim dressed in white – they would sing Chassidic melodies as the day turned to night and I couldn't imagine a more beautiful moment. Today, the crowd has grown by such numbers that it is unfortunately impossible to repeat that experience. There is an unmanageable amount of people all over, not to mention some inexplicably screaming, hollering or jumping up and down. I said tashlich and spoke with some old and new friends – it was still nice, but I was saddened by the change. Afterwards we returned to the kloiz, where I joined the group around R' Kenig; we sang a number of Breslover niggunim until Maariv, when – suddenly, it seemed – Yom Tov was over. It's funny; it felt like a weight was lifted. The pressure of Yom Tov was gone. I went back to the apartment to eat something and unwind. A couple of my kids went out in search of food and came back with sandwiches and drinks among other stuff. Eventually we fell asleep. Tzom Gedalya: I took my two younger children and went together with a friend and his young son to Sofia park. We spent the day there, and it was great; the kids ran around, we went boating, bought some stuff and had an all-around nice time. They park was full of Yidden – it looked like Chol Hamoed in NY. Tuesday: Or plane home was scheduled for 12:00, and they wanted us there by 9:30 AM. By taxi, Uman is approx. 3 hours from Kiev, so we would have to leave around 6:30. 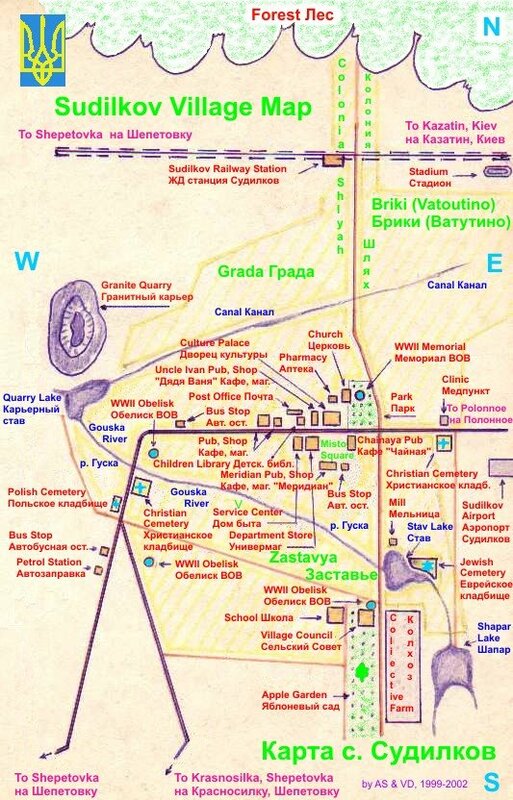 Now, since the resting place of R' Avraham the Malach (son the Mezricher Maggid) and R' Yisroel of Polotzk is in the town of Fastov, and not far from Kiev, we decided to plan a trip there on our way. The pans were arranged, and we left at 5:30 AM. Other than our driver getting shaken down by the highway cops for 10 "Grivne" (about $2.00 American) we got there without a hitch. The back roads and villages were a sight to see – and we got to daven at the gravesite (after going through a couple backyards), which was especially meaningful to me as a Chabad Chossid: the Malach (former Chavrusa of the Alter Rebbe) and R' Yisorel (a colleague of the Alter Rebbe and chossid of R' Mendele Vitebsker who had also made the pilgrimage to Eretz Yosroel – only to return to collect funds where he unfortunately passed away) had Chabad connections. We made our flight (which was delayed two hours once again) and arrived home on Tuesday evening. My kids and I are thoroughly exhausted, but I am uplifted. Honestly, I must say that anyone who doesn't make the trip – at least once in their lifetime – has really missed out on something special. I know of nothing that can come closer to the old time pilgrimages we read about in Chassidic history (or even to the Beis Hamikdash in ancient times) – just make sure to buy your wife something to bring her while your there. Kol hakavod for going! 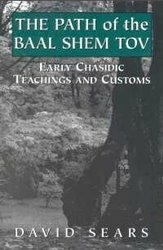 As was mentioned in a few previous posts, Chabad and Breslov are of the few chassiduyos that still have (or at least claim to) the light of the Baal Shem Hakadosh! They probably each have a different part of the light. If they come together - we might get the light back!! Very interesting post. I have a few friends that went. You had a hotel room all to yourself with your children ? i don't know if I would be able to concentrate on my davening with so many people crowding and pushing all around. It's not really a hotel, we rented an apartment in the first apartment building up from the Kloiz. As to davening, there was no pushing - we had purchased seats in the shul and I was pretty comfortable (albeit a bit short on leg room). For those who have not yet gone to Uman: there are about a dozen Soviet-era high rise apartment buildings adjacent to Rebbe Nachman's tziyun, which could accomodate many of thousands of people. And since the locals mostly rent out their apartments to the Chassidim and other visitors, they do! There were Jews renting apartments and villas (little village-type houses) and sleeping in huge tents provided by the Vaad, as well as in little dome tents of their own for miles around. Another comment: CE's description of the food scene was a little biased by his immediate situation. More than half of the cheder ochel was occupied by Chassidim who avoided speaking on the first night, when the din is most severe, and the food was pretty good, all things considered, and was served promptly and in an organized manner by bochurim and yungeleit who do this every year. Anyway, "mazal tov" to CE and all who went. Reb Nachman said that whoever comes to him for Rosh Hashanah should be happy the entire year! 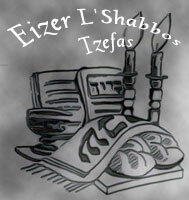 May it be a source of true simchah and hamtakas ha-dinim for all Klal Yisrael. Who is the photo of? Reb Elozer Kenig (sitting with black mantl over a white kaftn). 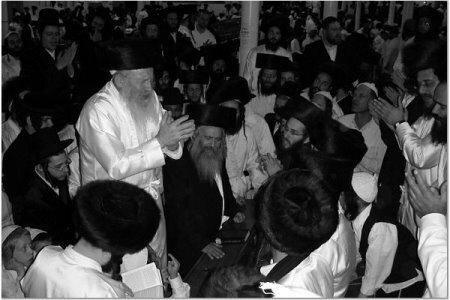 Reb Yakov Klayn (standing in white kaftn and clapping). What about robberys? Many luggage! What about... how much easier it is now compared to before? McAryeh: Thanks - My pleasure! As I said, I was only relating my experience which is in no way meant to be representative of anyone else's. I know that were problems with lost baggage (I did not hear of stolen baggage) - and I would recommend that if you go to Uman you should try to with the direct flights - it seems to me that the connecting flights often have baggage problems. And yes, there are always improvements. The conditions were better in a number of ways than they were the past. thanks for this detailed account.it was nice to read your appreciation of the davening.